Payoneer Review: Online international payments can prove to be hectic. There are several options available that vary in timing, cost, security and ease of use. Apart from your bank account, there are other online transfer services available. Most common solutions are PayPal, Bitcoin and Payoneer. Payoneer is a financial service company that provides various services such as online transfer and e-commerce services. It’s a registered member company that provides financial service worldwide. A quick Payoneer review shows that it offers two main features. Payoneer allows an account to pay several people online. This is a great feature for online marketplaces and companies like iStock, Airbnb and for every company that hires freelancers or contractors. Payoneer review indicates that the biggest benefit of having an account is that you can pay a lot of people internationally at no cost. It offers money transfer services for small and medium-sized enterprises and professionals. Users can get US or EUR collection accounts, irrespective of the fact if they’re in that country or not, which lets them get paid as if they lived in those countries. Payment receivers will also need a Payoneer account to collect their funds. Therefore, freelancers and contractors mentioned above also need to have a Payoneer Sign Up account to receive their payment. It seems like an excellent solution for international transfers as Payoneer provides users with a virtual US account and a routing number or a European account and BIC ad IBAN number so that they can easily receive payments like the locals. Users can withdraw these funds using a account or to their local bank accounts. It also promises to be more affordable as compared to PayPal, but let’s discuss what it takes to get started with Payoneer and how it works. One of the drawbacks, according to the Payoneer review, is that it requires you to pay an annual fee of $29.95. It’s not a lot of money, but for businesses that are accustomed to payment solutions such as PayPal where no upfront fee is necessary, it might prove to be a stumbling block. 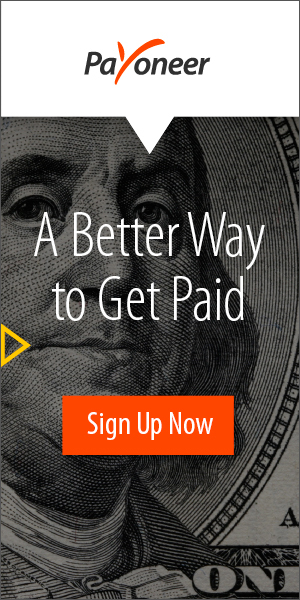 Once you sign up, you’ll receive a Payoneer account details. You can activate account using the website and you can use it to access your collected funds. You can get paid in two ways, either directly by using your Payoneer account or via the US or EU payment service. The easiest way to receive funds on your Payoneer account is through another Payoneer account, obviously. You can send or receive funds free and instantly. These funds are available within two hours of transfer. The limits on these transfers are $20 minimum and $1000 maximum and both Payoneer accounts need to have some money, which is the drawback. The limit in transfer makes it difficult for the service to be used by large businesses. The second method of payment is, of course, via a US or EU payment service. Payoneer provides you with bank credentials that allow the company to pay you quickly using these credentials via US or EU bank transfer. It is also worth mentioning in the Payoneer review that transfer via US payment service costs the user 1%, although the EU payment service is free of charge. Once you have received the payment, you can withdraw your money using two methods. You can use the service that is provided to you when you initiate a Payoneer account, or you can transfer the funds to your local bank account. This service works perfectly and doesn’t cost anything extra. However, ATM withdrawal charges will apply and that’s the only way you can use your account. Bank transfer fees vary, so you need to check with your local bank account for that information. To sum up this Payoneer Review, it can be said that this service seems fairly suitable for people who work online as freelancers. Although it doesn’t seem like the best option for regular businesses and companies regarding receiving and making international payments, it’s a safe and comfortable transfer service for two parties having Payoneer account. Payoneer Review: Choose to be paid by the biggest sites made money directly into your account. You will receive money in minutes! If you own a business, you can pay your employees in a fast, simple and inexpensively way, only with Payoneer. – look here. Payoneer offers free online account through which you can get the money that you have in your account. Payoneer Reviews – What is Payoneer? Payoneer is a comprehensive financial transfer, adapted to modern needs, in a world where the Internet is increasingly present. Payoneer is especially recommended for those who earn money on the internet, have certain internet business, and want to be paid quickly and safely. The advantage of Payoneer Account is not depend on particular bank, but you can use the Payoneer at any ATM, or you can store that accepts payments in any type online payments. Any person who needs financial services as receiving and withdrawing money, and that can be used almost anywhere in the world, by completing a sign up form. Compared with the costs of local banks, given that Payoneer pay fees for using other ATMs and transactions are international, you’ll find the lowest fees on the market. Purchases you make can be paid with Payoneer financial service, whether it’s about shopping online, pay online, or shopping at the supermarket, which accepts online payments. Payoneer Review: With Payoneer account, you can receive money from companies from around the world who pay only on American territory, without having to be a US citizen. Payoneer is wonderful and the fact that you can receive a Payoneer free by post on your address, and you’ll have online access to your account Payoneer where you can check the history of payments, how much money you have in your account, you can make various transactions or transfers money, and lured you to modify your Payoneer password or PIN. With Payoneer, you can withdraw money from any ATM, directly in local currency or in a currency of the country you are visiting. Payoneer is available in over 200 countries across the globe! Payoneer Review: With Payoneer can receive payments from various companies worldwide and can extract money after a few hours instead of several weeks, the classic postal check. You can also make financial transfers between Payoneer and your local bank, can enjoying the money made on the internet soon after you’ve got in account. Payoneer Reviews – It’s future! Anywhere, anytime access to your money! Review: Applying for a Payoneer account is easy, by completing a form with your data, after which you will receive in a short time (depending on your location) Payoneer details in your postal box. After activating the account and choosing a PIN, you can withdraw money directly from the ATM at the corner of the street. Now you have the chance to win $ 25 if you register on the button below Payoneer. To avoid fraud, money you will receive when your account will feed the first 100 dollars. I’m Payoneer user for 3 years, and I’ve never had any problems, I could in time make purchases directly from my account, and I was able to extract bancoman in local currency. Their support is a professional one, ready to solve any difficulties. I recommend them with all trust!